Dannon Company, Inc., manufactures and sells 6 million cups of yogurt every day, including Activia, Greek yogurt, Light & Fit, All Natural, Fruit on the Bottom and several lines marketed for children, according to the company website. The company markets Activia as a product containing a unique strain of bacteria called Bifidus Regularis which can, it claims, assist with regulating bowel movements. 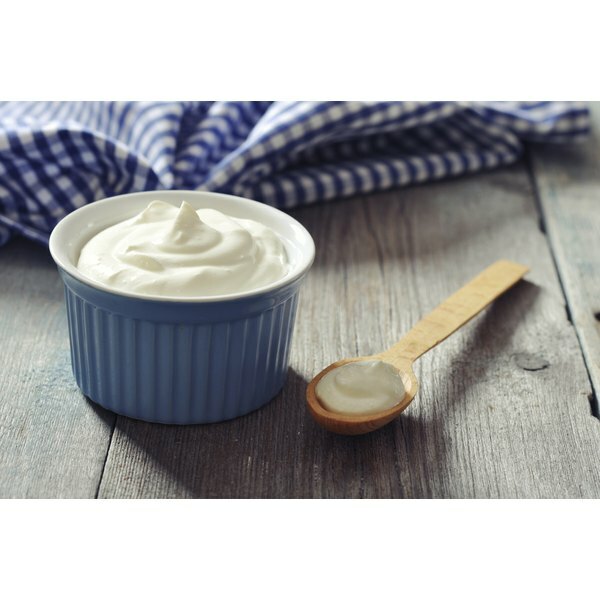 The basic recipe for yogurt involves adding two strains of live bacterial cultures -- Lactobacillus bulgaricus and Streptococcus thermophilus -- to warm pasteurized milk, according to the U.S. Food and Drug Administration. The bacterial cultures ferment the milk and cause lactic acid production, the source of yogurt's uniquely tangy taste. To this basic product, manufacturers may add sugar, fruit, honey, artificial sweeteners or other ingredients, as well as additional strains of bacteria. Probiotics, often called good bacteria because of their beneficial qualities, exist in the intestinal tract. Many supplements and foods such as yogurt, buttermilk, miso, tempeh, kim chi, some pickles, sauerkraut and some soy drinks also contain probiotics. Several studies have suggested that the probiotics in yogurt, including Activia, may help to reduce the undesirable bacteria in the digestive tract that cause infection or inflammation. Probiotics may also replace good bacteria that have been killed by taking antibiotics. In addition to the live bacterial cultures used to make all yogurt, Activia contains Bifidus Regularis, a trademarked name for an organism normally present in the human intestines called Bifidobacterium lactis DN-173 010. Bifidobacteria, also called lactobacteria or lactic acid bacteria, are part of the group of probiotics found in fermented foods such as cheese and yogurt. Activia's marketing claim that no other yogurts contain Bifidus Regularis is true because the trademarked name cannot be used by another company. However, consumers who believe that Activia's beneficial effects on the body exceed those of other yogurts containing different strains of probiotics or good bacteria may find little scientific evidence to support that belief. In fact, in December 2010 Dannon agreed to a settlement with the Federal Trade Commission for $21 million dollars based on overexaggerated claims about Activia's effects on digestive irregularity and prevention of flu and colds.